Do you have what it takes to rule the secret and Machiavellian world of the undead? Since time immemorial, the Kindred - vampires - have stalked unseen by the mortal masses upon whom they prey. Their world is a xenophobic, neo-feudal nightmare, and each city is ruled by a Prince, the most powerful and influential Kindred of them all. The Prince's word is inviolate and his actions are unquestionable. All Kindred turn to the Prince for protection, favor and for guidance in these modern nights. But the prince has been destroyed and his legacy is in ashes. The mantle of leadership must fall to another: one of the Primogen, vampiric elders who lead their unique clans of Kindred. The competition will be fierce, and only the most prestigious and cunning Kindred will prevail. Deals will be struck, alliances forged and agreements broken. Do you have the wits, guile and ruthlessness to become the new Prince of the City? 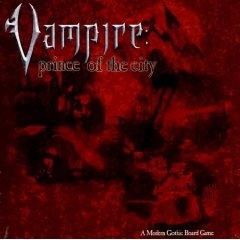 Now you can download the complete Vampire: Prince of the City Rulebook for free. Use this edition to replace a lost or damaged version of the Rulebook that came with your game or just to have an extra copy on-hand.